Encuentra asistencia y herramientas específicas para tu KYOCERA Cadence LTE en Internet. Learn how to activate and set up your Cadence LTE. Learn how to use your device with our interactive simulator. Here's how to activate and setup your Cadence. Here's how to set alerts on your Cadence. Here's how to move pictures to your SD / Memory Card on your Cadence. Here's how to transfer music files between your Cadence and a computer. Here's how to transfer picture or video files between your Cadence and your computer. Learn how to charge your Kyocera Cadence. An interactive map of the Home screen and buttons on your Kyocera Cadence. Discover more about the back of your Kyocera Cadence. Learn how to power on and shut down your Kyocera Cadence. Here's info on the battery specs (e.g., Usage Time, Standby Time, etc.) for your Cadence. Here's how to insert your battery on your Cadence. Here's how to remove your battery on your Cadence. Here's how to make your Cadence visible to Bluetooth devices. Here's how to delete a paired Bluetooth connection from your Cadence. Here's how to send a contact via Bluetooth on your Cadence. Here's how to turn Bluetooth on or off on your Cadence. See how to pair your Kyocera Cadence with your Bluetooth device. Here's how to change the options for answering calls on your Cadence. Here's how to send unwanted calls directly to voicemail for your Cadence. Here's how to make a call on your Cadence. Here's how to delete your call history on your Cadence. Here's how to place a conference call on your Cadence. Here's how to redial on your Cadence. Here's how to reset your call timers on your Cadence. Here's how to set up your speed dials on your Cadence. Here's how to view your call history on your Cadence. Here's how to view your call timers on your Cadence. 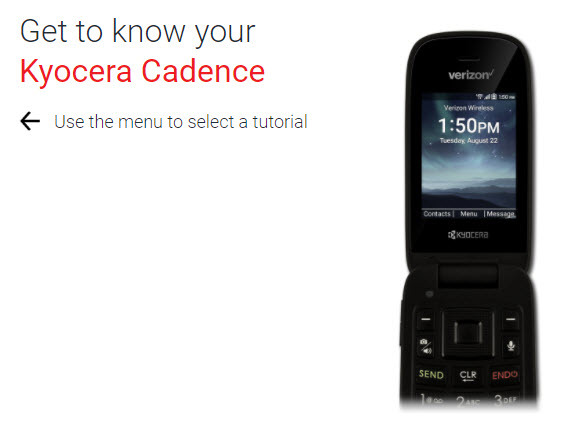 An interactive guide on how to call a contact using your Kyocera Cadence. Discover how to use your Kyocera Cadence to call a new number. A visual guide for ignoring a call and sending a text message to the caller with your Kyocera Cadence. Learn how to switch between two phone calls on your Kyocera Cadence. Learn how to teach kids to call 911 on your Kyocera Cadence. Learn how to call a number handsfree on your Kyocera Cadence. Discover how to view a missed call and add it as a new contact on your Kyocera Cadence. Here's how to access your camera settings on your Cadence. Here's how to view a picture on your Cadence. Learn how to take a picture of the screen and view it on your Kyocera Cadence. An interactive guide on how to change the size of your pictures or videos with your Kyocera Cadence. Learn how to record a video using your Kyocera Cadence. A visual guide for sharing photos by email, social networks and more using your Kyocera Cadence. Discover how to take a photo using your Kyocera Cadence. A visual guide for transferring photos to the SD Card on your Kyocera Cadence. Here's how to transfer media between your Cadence and PC. Here's how to add a contact on your Cadence. Here's how to delete a contact on your Cadence. Here's how to edit a contact on your Cadence. Learn how to add a new contact to your Kyocera Cadence. A visual guide for how to add a contact to favorites on your Kyocera Cadence. Find out how to add a picture to a contact on your Kyocera Cadence. Learn how to assign a ringtone to a contact, so you know who's messaging your Kyocera Cadence without looking at it. A visual guide for how to create a group of contacts on your Kyocera Cadence. Learn how to share the information for one of your contacts with someone else using your Kyocera Cadence. Here's how to change the data usage cycle on your device, view data usage and set data warnings/limits on your Cadence. Here's how to turn your mobile data on or off on your Cadence. Here's how to fix your incorrect date and/or time on your Cadence. Here's how to view your device ID (ESN / IMEI / MEID) on your Cadence. Here's how to view your device's information on your Cadence. Here's how to view your phone number on your Cadence. Here's how to adjust your backlight for the keypad on your Cadence. Here's how to adjust your brightness settings on your Cadence. Here's how to adjust your display settings including your clock on your Cadence. Here's how to adjust your font settings on your Cadence. Here's how to set shortcuts up on your Cadence. Here's how to put your device in airplane mode on your Cadence. Explore how to access settings on your Kyocera Cadence to change alert sounds, turn off GPS and more. A visual guide for saving battery life on your Kyocera Cadence by adjusting the screen timeout. Find out how to change roaming settings on your Kyocera Cadence. Learn how to change the ringtone on your Kyocera Cadence. Learn how to manage location settings on your Kyocera Cadence. Discover how to manage data usage on your Kyocera Cadence. Learn how to do a factory reset on your Kyocera Cadence. Explore ways to mute your Kyocera Cadence. An interactive guide for setting your Kyocera Cadence to Airplane mode. Here's how to add an email account on your Cadence. Here's how to delete email messages from your Cadence. Here's info on common email settings (e.g., account name, etc.) for your Cadence. Here's how to modify data usage options for your email account on your Cadence. Here's how to get notifications, if you're not getting notifications for email on your Cadence. Here's how to update the email password/server settings for your Cadence. Here's how to enter or edit the email signature on your Cadence. Here's how to adjust the email sync frequency settings on your Cadence. Here's how to remove an email account and add it back using your Cadence. Here's how to view your email on your Cadence. Here's how to view your email messages on your Cadence. Learn how to forward an email on your Kyocera Cadence. Learn how to attach a file, like a document or photo, to an email with your Kyocera Cadence. Discover how to reply to an email on your Kyocera Cadence. A step-by-step visual guide for sending an email from your Kyocera Cadence. See how to send a group email on your Kyocera Cadence. Learn how to access your work email on your Kyocera Cadence. See how to access your existing email account on your Kyocera Cadence. See how to access different email accounts on your Kyocera Cadence. Here's how to adjust your GPS location setting for your Cadence. Learn to use shortcuts to navigate the screen on your Kyocera Cadence. Here's how to change the Mobile Hotspot password on your Cadence. Here's some info if you're having issues connecting to the Mobile Hotspot on your Cadence. Here's how to configure Manage Mobile / Wi-Fi Hotspot Settings (e.g., password, allowed devices, etc.) on your Cadence. Here's how to turn Mobile Hotspot on/off on your Cadence or if you can't connect to Wi-Fi. Here's how to add a browser bookmark on your Cadence. Here's how to clear the cache on your Kyocera Cadence. Here's how to delete a browser bookmark on your Cadence. Here's how to edit your bookmark on your Cadence. Here's how to open a website from a saved bookmark on your Cadence. Here's how to access the web on your Cadence. Learn how to bookmark a website on your Kyocera Cadence, so it's easy to find later. A visual walkthrough of clearing browsing data in the web browser of your Kyocera Cadence. Discover how to find a website using your Kyocera Cadence. Learn how to use web browser windows on your Kyocera Cadence. Here's how to change the language selection for your Cadence. Discover how to change the language settings on your Kyocera Cadence. Here's how to change the lock code on your Cadence. Here's how to set up a lock PIN on your Cadence. Here's how to unlock your screen on your Cadence. A visual guide for setting screen security on your Kyocera Cadence to help protect your private information. See how to unlock the screen on your Kyocera Cadence. Here's how to erase your SD / Memory Card on your Cadence. Here's how to insert your memory card on your Cadence. Here's how to remove your memory card on your Cadence. Here's how to free up space if your device runs slow or crashes or resets, or you can't save media on your Cadence. Here's how to move files from phone / SD storage on your Cadence. An interactive guide for setting up your Kyocera Cadence as a Mobile Hotspot, so you can share your data connection with other devices. Here's how to play music on your Cadence. See how to navigate your Kyocera Cadence and its virtual device. Here's how to check to see if your software is up to date on your Cadence. Here's how to lock / unlock and edit your SIM PIN on your Cadence. Here's how to insert your SIM card on your Cadence. Here's how to remove your SIM card from your Cadence. If the SIM PIN for your Cadence is blocked, here's how to unblock it. Here's how to view your SIM card info on your Cadence. Find out how to insert and remove a microSD card from your Kyocera Cadence. Find out how to insert and remove a nano SIM card from your Kyocera Cadence. Here's how to save a stored music file as a ringtone on your Cadence. Here's how to set a ringtone on your Cadence. Here's how to turn on your speakerphone on your Cadence. Here's how to increase your volume on your Cadence. Here's how to cut, copy. and paste on your Cadence. Here's how to capture a screenshot on your Cadence. Here's how to change the TTY settings on your Cadence. Here's how to use voice activated commands on your Cadence. Here's how to set the wallpaper on your Cadence. Learn how to change the background of the Home screen on your Kyocera Cadence. Learn how to use notifications on your Kyocera Cadence. Here's how to add a Wi-Fi network to your Cadence. Here's how to set your data roaming settings if you're having issues with calls, messages or data services on your Cadence. Here's how to set network mode settings if you're having issues with calls, messages or data services. Here's how to remove a saved Wi-Fi network from your Cadence. When turned on, Wi-Fi Calling may improve indoor call quality for your Cadence. Here's how to turn Wi-Fi for your Cadence on or off. This can help if you can't access your Mobile Hotspot. Learn how to use your Kyocera Cadence to connect to a Wi-Fi network, so you can access the internet without using data.